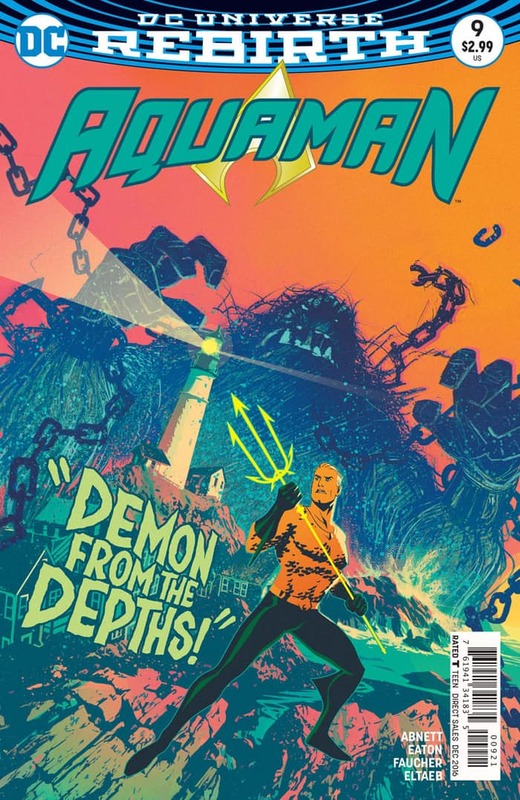 In the previous issue, having sensed a mysterious monster moving towards Atlantis, Aquaman speeds off to confront it, assisted by his personal guard. Encountering the creature, Aquaman attempts to reason with it before being swat aside, the creatures march barely even being slowed. The guard opens fire on the creature, Aquaman even returning to attack it with his trident, but the creature quickly heals all of their damage, again hardly even slowing down. Back in Atlantis, Mera begins her schooling with the Widows when the battle horns sound. Intending to go see what is happening and possibly help, she is informed that if she leaves now, she will never be queen, the Widows continuing to question her worthiness even while saying it. Back with Aquaman, he orders a powerful strike be performed on the creature, bombing the area an revealing the identity of the creature as the muck and grime blow away: The Shaggy Man. This issue starts off with the realization that the monster's target is not actually Atlantis, but Arthur's other home, Amnesty Bay. Now knowing the identity of the monster, Arthur realizes his error, the Shaggy Man adapts to all attacks, becoming immune to them. Hoping to stop the monster rather than kill it, Aquaman orders his military to target the sea floor around the monster, attempting to trap it, but unfortunately is unsuccessful. Chasing the monster onto land and into Amnesty Bay, Aquaman attempts to take the monster on head-to-head, ignoring Murk's suggestions to contact the Justice League. Finally caching up with his King, Murk berates Arthur for his arrogance and stubbornness in wanting to prove to the League that he can handle the situation on his own, causing Arthur to jump back into combat with the creature, embedding his Justice League identification card into the creatures hair and activating the watchtower's teleportation technology, teleporting the creature into orbit. One of the things I really enjoyed about this issue was the brief look at Amnesty Bay, Aquaman calling everyone he sees there by their first name, showing his history and attachment to the town. The artwork is still fairly mixed, with characters jumping back and forth between being drawn well and poorly seemingly between panels. The quality is there, and it's clear that the artist has talent, he simply needs to take more care with consistency in expression and form, specifically when it comes to character's faces. I do, however, still enjoy the little touches of Atlantean aesthetic and marine creatures littered throughout the issues. Ultimately, I enjoyed this quick diversion from the overall plot, and it did a good job of showcasing both Arthur's affection for his home on land, as well as his character flaws that make him an interesting hero. Arthur's arrogance was what almost lost them the fight, and it was him swallowing his pride, while still maintaining his dignity that eventually won. Aquaman is an interesting character because he does walk that thin line between land and sea, king and hero, and the best stories explore that dynamic. This story, while relatively simple, explores that and is, in my opinion, the better for it. I look forward to getting back to Black Manta, and hope some of that nuance that seemed to be lost in the first couple issues continues to reassert itself in the future.